It’s common for people to refer to both catnip and catmint as a single plant cats love to play with. While they are both beloved by cats, there are a few facts that can distinguish one from the other. Catnip (Nepeta cataria) is a species in the Nepeta genus of the flowering mint plant (Lamiaceae) family. It is also commonly referred to as catswort or catmint. Catnip is native to the eastern and southern regions of Europe, central Asia, and some regions in China. This herbal plant has spread to northern Europe, North America, and New Zealand. The term catnip is derived from the intense liking most felines have towards this plant. Catnip is a herbaceous perennial. It is a flowering plant that flourishes during the spring and summer. It dies back in the autumn and winter. The catnip’s rootstock then grows back when spring comes around. Catnip lives for more than two years. It looks like any member of the mint family with its square stem and triangular coarse-toothed leaves. 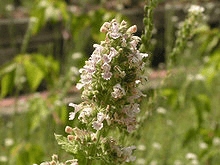 Catnip flowers are usually fragrant and white in color with purple or pink spots. Catnip has been used to treat different ailments in the past. It can be ingested as a medicinal tea or smoked as a herbal cigarette as a relaxant (effects unproven). It was used as an antiseptic and an effective insect repellent. Cats love catnip; they would rather eat it than roll around in it. It contains nepetalactone, an organic compound known to affect the behavior of cats, including cougars, lynxes, cougars, and even lions. Catmint, or Nepeta x faassenii is another species under the Nepeta genus. It is a garden hybrid and its parent species are the lesser catmint (Nepeta nepetalla) and the dawrf catmint (Nepeta racemosa). This catmint plant is an herbaceous perennial with fragrant, oval, gray-green leaves with intricate veins. It produces trumpet-shaped flowers in soft lavender colors. Many people cultivate catmint plants because of their aromatic foliage and abundant lavender flowers. Masses of catmint makes a good border edging and groundcover. Catmint may be used fresh, dried, and even frozen. It is known for its herbal quality and culinary use. Most people advise harvesting leaves as soon as the flowers start to bloom. The top leaves and stems can be added to sauces and soup, and are believed to bring calming effects on the nerves and soothe coughing ailments. The term catmint (Nepeta) is also used to refer to a group of flowering plants under the family of mint plants. There are approximately 250 species in the Nepeta genus, which also include catnip. The majority of plants under the catmint genus are herbaceous perennials, but some are annuals. 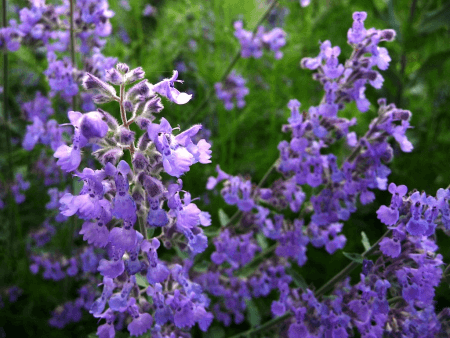 Tubular flowers of the catmint group range from white, blue, lavender, lilac, or pink, and spotted with small lavender-purple dots. Plants in this genus have sturdy stems and green or gray-green leaves. So what’s the difference between catnip and catmint? Although both terms are used interchangeably, there are minor differences between these two species. Catnip (Nepeta cataria) is a flowering plant with triangular or egg-shaped leaves with colors ranging from brown to green. Catmint (Nepeta x faassenii) is a garden hybrid from two different catnip species. It is characterized by fragrant, oval-shaped, veined leaves. Cats love nibbling on catnip leaves, but rolling on catmint plants.